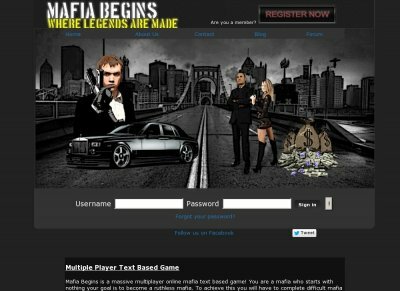 If you do not wish to vote at this time, click here to visit Mafia Begins stats. As people began to rely more and more on the Federal Government for all their needs, the Feds started to take rights from everyone. People began to realize that the only way to regain their freedom was to fight back. In order to fight back, Mafia's were formed to keep organize to break down the Feds. As you enter this world, families are formed quickly to watch each other's back. Also, Federal assassins target the unexpected. Creating strategies to advance becomes very important for survival. Born with very little, you inherit crystals that contain great value to start you on the right track to ownership. But are you the one that is owned? These crystals are the only currency that protect you from the recession. No matter the price of goods, crystal values only increase over time. Gaining more crystals is only done by finding the right crimes, stealing from others, and/or gaining VIP status. As you grow in Mafia Begins (MB), it will become safer to use the bus system from the past prosperous world, the Bus Station. Each new city you travel to has various items to expand your growing inner boss in order to take on the other members of MB. Fast personal growth is noticed so be aware of those that wish to take you down!! Once you are stable and equipped with the tools to succeed, carve out your section of the Universe and form your own gang to take on the leaders. Many different groups have lead MB, will you be the next?